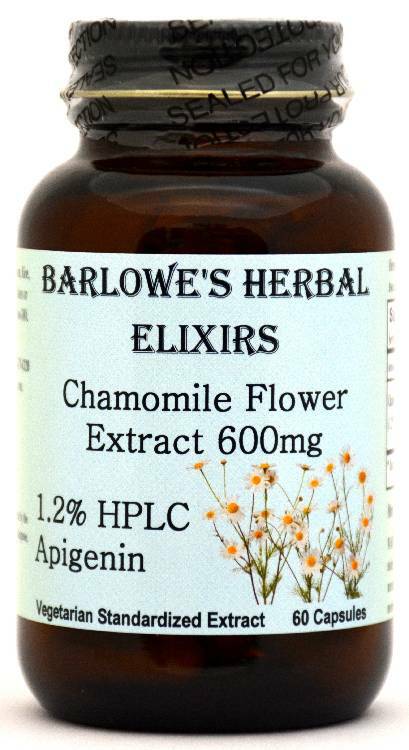 Barlowe's Herbal Elixirs now offers a high potency German Chamomile (Matricaria Recutita) Extract standardized to 1.2% Apigenin. Chamomile is useful to calm frayed nerves and to relieve muscle spasms. The Apigenin in this Extract is also a potent aromatase inhibitor - preventing the conversion of testosterone into estrogen. Bottled in Glass! No Stearates! No Fillers! No Junk! Now 600mg! Barlowe's Herbal Elixirs now offers a high potency German Chamomile (Matricaria Recutita) Extract standardized to 1.2% Apigenin. Chamomile is useful to calm frayed nerves, to treat various digestive disorders, to relieve muscle spasms, and to treat a range of skin conditions and mild infections. The Apigenin in this Extract is also a potent aromatase inhibitor - preventing the conversion of testosterone into estrogen. The medicinal use of Chamomile dates back thousands of years to the ancient Egyptians, Romans, and Greeks. 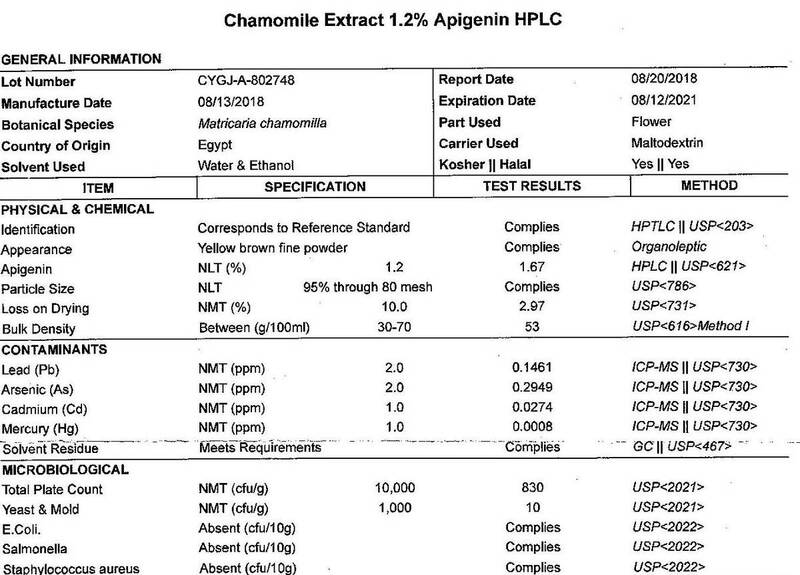 The Chamomile Certificate of Analysis (COA) for this particular batch is shown above. Bottled in Glass! No Stearates! No Fillers! No Junk! Aromatase, an enzyme found in the liver, is responsible for the conversion of androgens into the estrogens Estrone and Estradiol. By inhibiting aromatase the body produces less estrogen and maintains a higher testosterone state. In men aromatase activity increases with age, converting what little testosterone is left into estrogen. It is perhaps this event that is most responsible for the many symptoms of "male menopause." Apigenin is an excellent natural substance to prevent this conversion. Studies have shown that Chamomile relieves anxiety and promotes sleep. This is the way Chamomile is most utilized in the United States. However, in Europe it is widely used to treat digestive problems and skin irritation. It has strong anti-inflammatory and anti-bacterial activity. 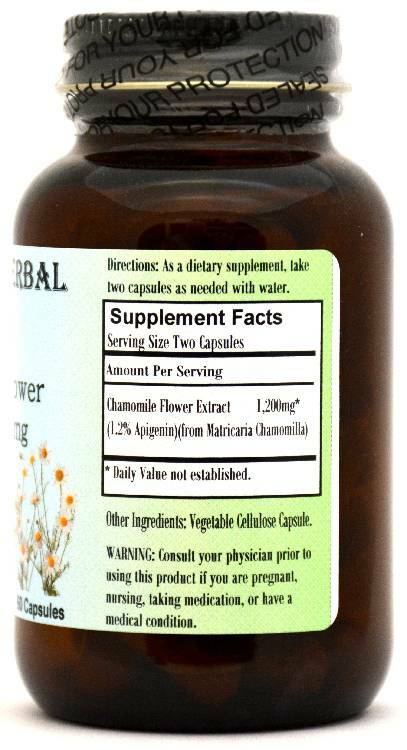 Caution: Barlowe's Chamomile Extract is generally safe, but it is potent and should be utilized with care. People allergic to ragweed or members of the Compositae family, such as chrysanthemums, should avoid this product. This product is for dietary use. If unexpected side-effects occur, discontinue use immediately! The above statements have not been evaluated by the Food and Drug Administration (FDA). This product is not intended to diagnose, treat, cure, or prevent any disease. Directions For Use: Take two capsules twice a day without food. Results and usage amounts may vary based on body type and weight.